"I must become a lion-hearted girl." Let me just start by saying that I've felt a recent pull at the founding of Massachusetts Bay (and Salem, but that's a whole different story ). Actually, the MA Bay had much more to it than I'd expected, and it's just something my mind would love to delve deeper into. In this thread you'll find ideas of mine (that I came up with my own imagination and the help of books), and a possible roleplay (which obviously is group-based, seeing as I put it in that section!). Thank you for taking the time to read this, listen to me blabber on and on, and maybe even reply (if you get that far into it )! To make a long story short: a man named John White traveled to the Americas with a new group of settlers (seeing as his first trip had failed dye to the people dying off from starvation and things of the sort), which included not only men, but women and children. 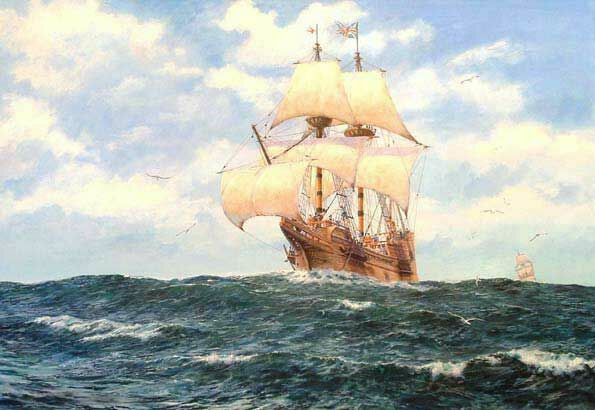 Quite soon, however, supplies ran low, which caused Mr. White to sail back to England, leaving behind 117 colonists. White planned to return shortly, but when he'd arrived back in England, he was just in time to find out a a war (between England and Spain) was about to break out! It took him about three years to get back to the Americas to find the colonists he'd left behind from the second trip; but, when he did finally arrive, he found everything was deserted. Forts and things of the sort were still intact, but not lived in. The only sign of the colonists was a carving in a tree, which said "Croatoan," the name of a nearby island. In real life, nobody is sure of what happened to this 'Lost Colony;' on my own, I have come up with two possible conclusions to the story. Conclusion two: most of the colonists left for this island named Croatoan. There is no known location of it, and is virtually impossible to find, as if it doesn't even exist. The land there, too, is dry and barren, and the people struggled to obtain food. Few have left this so-called safe haven, and not just because they didn't want to leave it, but also because most didn't live to escape from it. Spirits of the people that once settled this rich and beautiful island now torment the current residents. The options for characters would be: (with conclusion one) infected and clean; (with conclusion two) living beings and spirits. It is preferred that a few players take on the role of two characters. There are currently five or six slots open for participants. There's only two, don't fret! Stick to the story. Remember: this takes places in the late 1500's/early 1600'. Be literate. I prefer a few good paragraphs rather than a few good lines, as do most others. To apply, you must post: a character description/skeleton and a (small) writing sample. I could get in on that. both conclusions sound fun. The DJ red alert goes berserk! Well, it's good to hear that two people would already be willing to join! If you have any questions for me about the roleplay at hand, you're definitely more than welcome to PM me or talk here. Since you're both aware I don't plan on starting this too soon, maybe either one of you would like to share your opinions on this as to what should be tweaked or left as is? Every writer can get better somehow, whether it be by harsh criticizing or compliments! I would love to be involved in this. With enough people this could be the 'ideal' roleplay where we are all telling our own stories in a given community. I might possibly go for this. Once more, I'm quite glad to hear people actually do like my idea! To be truthful, I hadn't the slightest idea it would even catch anybody's eye. I think we could do some good with this, but there will be much more added soon, hopefully. I actually had an idea that the roleplay itself could be based off of journal entries, but I'll still have to give it some thought. It would also be excellent if there was a narrator of some sort, which I might try to do myself, to explain the scenery mostly, and maybe artifacts that were left by others who'd occupied the island before. Now, if we just had any females who were interested, this could possibly get started somewhat soon! This sounds very interesting. I really like the second scenario. Let me see if I can't come up with some ideas that might help and pm you with them. Well, things (and a group of people willing to roleplay in this setting) seem to be coming together, thankfully! I really can't say how long I've had this idea in my head, and it feels good to get it out in the open. MzNurse: That would be very helpful if you would, as well. I've been quite busy lately, and things have been keeping me from Elliquiy. I do hope to hear from you all soon, with your ideas and such of the sort! So can we start it? I'm assuming we can fairly soon; I just have to get situated and things of the sort. I feel as if the plot is a bit unfinished, seeing as we still have to choose the general outcome. Also, I'll have to start with an introduction, which may take some time. (Sometime can be anywhere from a few hours to a few days, depending on my schedule.) I may even be the narrator here, or I might play a character... these things can come later, though. We also will need more females to participate. There's two beings available in each conclusion, and, so far, nobody has picked whom they'd like to be. Thanks for being patient, everyone, it's appreciated! EDITED AND UP FOR DIBS!